Volunteers are central to sport at all levels, from mega-events to grassroots clubs. Sport Volunteering is a definitive guide to the issues associated with managing volunteers in sport. It focuses on the psychology of the voluntary experience, the management challenges inherent in managing a volunteer workforce, for not for profit and other groups, and the development of volunteers. 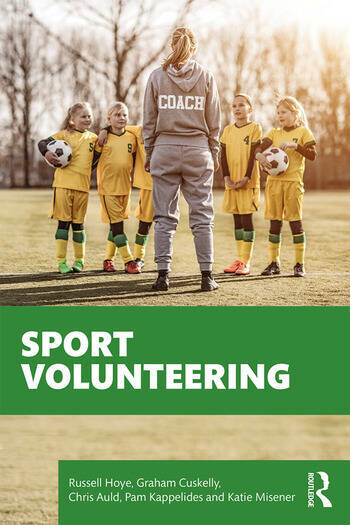 It provides a perspective on the roles of volunteers in the development and delivery of sport in a range of contexts - events, clubs, associations and other non-profit groups – and explores important contemporary issues such as sustainability, diversity and the management of risk. This book is essential reading for anybody studying sport volunteering or managing volunteers in sport, and a valuable resource for students of sport development, sport management, sport business, sports events, sport administration, sport policy, community sport, sport facilities, sport operations, event management or sport coaching. Russell Hoye is Pro Vice-Chancellor for Research Development and Director of Sport at La Trobe University, Australia, where he previously served as Director of the Centre for Sport and Social Impact. He is also an Adjunct Professor in the School of Human Kinetics at the University of Ottawa, Canada. His research interests are in corporate governance, public policy, volunteer management and the impact of sport on individuals and society. He is the Editor of the Sport Management Series for Routledge and is a member of the editorial boards for International Journal of Sport Policy and Politics, Sport Management Review and the Journal of Global Sport Management. Graham Cuskelly is Head of the Department of Tourism, Sport and Hotel Management in the AACSB accredited Business School at Griffith University, Australia. His research interests are in volunteers in sport, the development of community sport, and sport organisation and governance. He has been chief investigator on four Australian Research Council grants and a Canadian Social Sciences and Humanities Research Council grant. His most recent funded research projects include the resilience of community sport organisations impacted by natural disasters, and the economic value of community club-based sport. Chris Auld is Dean of Macleay College, Australia. He was previously the Deputy Vice Chancellor (Academic) at the International College of Management Sydney and was Dean (International) and Head of Department with the Griffith Business School, Griffith University, Australia. His research interests include community sport, the management of sport volunteers, board performance and governance in third sector organisations, and the impacts of major sport events. In 2010 he was elected as a Senior Fellow and Founding Member of the World Leisure Academy. Pam Kappelides is Lecturer in Sport Management at La Trobe University, Australia and an expert in the field of volunteer management, community development, youth and children development, disability and minority groups and the impact of sport participation and development in the community. She has also secured significant research projects and has consulted to many sport organisations and government agencies such as VicHealth, YMCA, Special Olympics, Masters Sport, Tennis Victoria, Football Federation Victoria Sport and Recreation Victoria, and various local government councils. Katie Misener is in the Department of Recreation and Leisure Studies, Faculty of Applied Health Sciences at the University of Waterloo, Canada. Her primary research focuses on the capacity and social impact of nonprofit community sport organizations, with a particular focus on how capacity can be enhanced to support sport service delivery and foster social engagement through sport. Her research interests also include the role of sport organizations in community health promotion and creating collaborative value through interorganizational relationships.